The Portland Art Museum (PAM) began in 1892 as the dream of the seven members of the Portland Art Association to bring art and art-education to the people. What started in a library as a 100 piece collection of Roman and Greek plaster casts is now the oldest art museum on the West Coast housing over 42,000 works of art. It’s also the seventh oldest art museum in the country proving that big and established culture exists opposite the East Coast. The acquisition funds for the original collection of casts was donated by beloved local citizen Henry Corbett, a man who epitomizes that Westward Ho! gumption so prominent amongst Oregon settlers. In 1851, at just 23, he signed a deal with Williams Bradford & Co. to sell their goods in Oregon, an agreement that required him sailing the treacherous route around Cape Horn to land in Portland. Somehow he saw potential in that town of only 821 people and managed to create the thriving business that would make him one of Portland’s most influential citizens and provide him the $10,000 that would start PAM. The Corbett Collection along with other early acquisitions outgrew the library and moved to a new location in 1905. Under the watchful eye of the first two curators, both wily women of the West, the museum continued to expand and acquire, eventually moving to its current home in 1913. The second of these women, Anna Belle Crocker, would go on to head the Museum of Art School which is now the Pacific Northwest College of Art, a separate entity from the museum. Keeping Portland weird since the turn of the century, the success of these women is unique and notable when you consider that even in 2014 only 24% of museum directorships at major museums are held by women. Besides being a bastion of West Coast business broad’s bravada, the museum also has amazing collections of Native American and North Western Art along with the largest exhibition space for modern and contemporary art in the region. With 90% of the 112,000 square feet of galleries devoted to the permanent collection there is no rush to see your favorite pieces before they are hidden away in the archives. This means even the most budget conscious art aficionados have plenty of time to eventually see the entire collection by taking advantage of the monthly 4th Friday free admission nights. Make sure to check out their always packed monthly calendar for lectures, films, and special family themed docent tours. For bonus points see how many times you have an excuse to quote everyone’s favorite Portlandia skit by saying “Shell art is over!” to your hopefully good-humored fellow patrons. The Portland Art Museum in Portland, Oregon, United States, was founded in 1892, making it the oldest art museum on the West Coast and seventh oldest in the US. Upon completion of the most recent renovations, the Portland Art Museum became one of the 25 largest art museums in the US, at a total of 240,000 square feet (22,000 m²), with more than 112,000 square feet (10,400 m²) of gallery space. The permanent collection has more than 42,000 works of art, and at least one major traveling exhibition is usually on show. The Portland Art Museum features a center for Native American art, a center for Northwest art, a center for modern and contemporary art, permanent exhibitions of Asian art, and an outdoor public sculpture garden. The Northwest Film Center is also a component of Portland Art Museum. 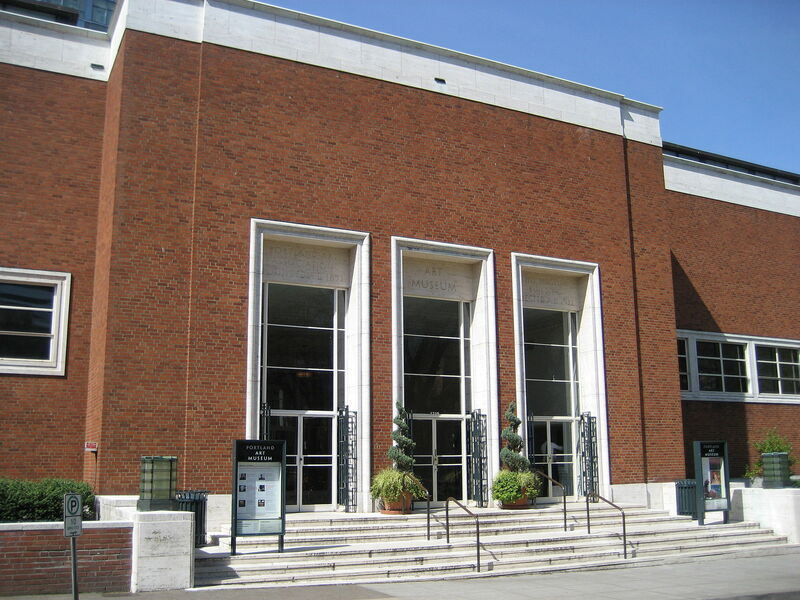 The mission of the Portland Art Museum is to serve the public by providing access to art of enduring quality, by educating a diverse audience about art and by collecting and preserving a wide range of art for the enrichment of present and future generations. The museum is accredited by the American Alliance of Museums, with accreditation through 2024. Check out the full Wikipedia article about Portland Art Museum. This week, behold Francis Bacon’s Three Studies of Lucian Freud. From The Story of Nastagio degli Onesti (Part I) by Sandro Botticelli in the Prado.